Seven members of the Harbour Gold Squad traveled to Canada for focused training and team building in Ontario, Canada. The swimmers finished with an impressive showing at the Gus Ryder Memorial Cup Invitational at the Olympium Pool in Etobicoke, Ontario. 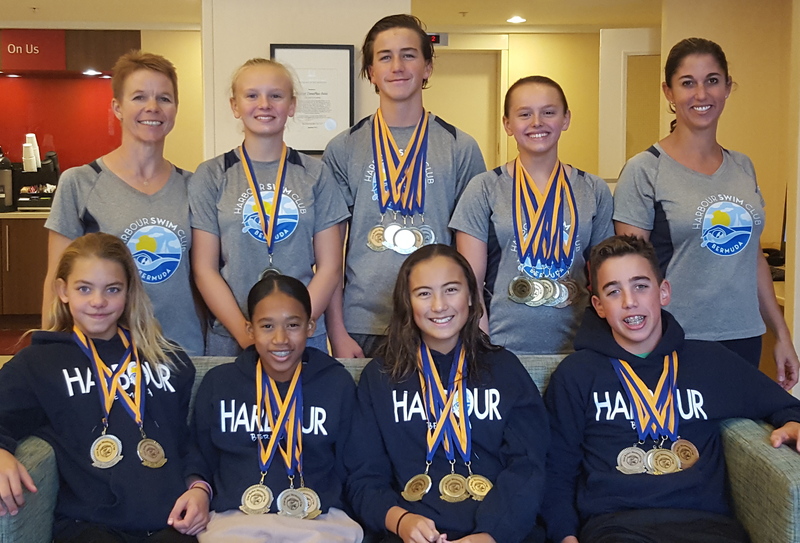 The Harbour team, consisting of Alyson Scherer, Lindsay Scherer, Finn Moseley, Myeisha Sharrieff, Caitlin Coleman, Giada Dudley-Pun and Brandon Adkins captured 25 Medals, 15 Gold, 7 Silver and 3 Bronze. The team also accomplished 31 personal bests in 38 swims, coaches Shona Palmer and Jenny Smatt were pleased with the results the swimmers posted over the weekend. “The swimmers applied themselves in training all week, set their goals and each of the them rose to the challenges presented. Following this intense training week, the results are a great indication of what is to come for us as a team and for the sport of swimming in Bermuda,” said Gold Squad coach and former Olympian Smatt. Scherer and Moseley set the tone early in the meet when each of them made significant improvements to their personal bests capturing Gold in the 100m Freestyle events posting times of 57.01 and 1:01.52 respectively. The afternoon session brought outstanding swims from Adkins, dropping almost 5 seconds in the 200 Freestyle swimming to a personal best time of 2:17.40, Dudley-Pun swam to Gold in a personal best time of 35.99 in the 50 Breaststroke, Coleman swimming to a personal best time of 41.08 in the 50 Butterfly and Sharrieff to a personal best time of 2:26.44 in the 200 Freestyle. Day Two brought more excitement to the pool when Sharrieff captured Gold in the 11 to 12 Girls 100 Freestyle in a time of 1:06.39, Scherer captured another Gold in the Girls 15 and over 200 Freestyle in a personal best time of 2:18.09 and Moseley swam to Gold in the 13 to 14 Boys 50 Backstroke in a personal best time of 30.83. The meet finished with the 50 Freestyle where Harbour swimmers took Gold in several Age Groups, all achieving personal best times in this event.